With the launch of its new BF100 horsepower (hp) four-stroke engine, Honda Marine has introduced the most powerful outboard to join its mid-range engine lineup. With a full-throttle RPM range of 5500-6300, the Honda BF100 is a four-cylinder, 1496cc (91.4ci) four-stroke engine weighing in at 366 pounds (166 kg). The design and technology applied to the new Honda mid-range marine engine is the same that powers Honda automobiles such as the Accord, CR-V, Civic, Fit, Odyssey and Pilot. The Honda BF100 incorporates Variable Valve Timing and Lift Electronic Control (VTEC) utilizes mild cam lobes to operate intake valves at low rpm, then engages a high-output lobe for higher-rpm operation. The design provides a blend of power, torque and efficiency at any speed. First debuted in the Acura NSX sports car, VTEC technology offers a broad, flat torque curve and smooth power delivery throughout the engine’s entire operating range. The Boosted Low Speed Torque (BLAST) System improves hole shot and acceleration by advancing ignition spark timing to within one degree of the knock limit during ‘hammer down’ acceleration. The resulting boost in available torque at low rpm contributes to a strong hole shot to get the boat up on plane quickly. The ignition spark timing is appropriately adjusted under slower throttle advancement, ensuring a leaner air/fuel mix and class-leading fuel efficiency. Lean Burn Control, a feature that automatically adjusts the air/fuel mix according to speed and load while maximizing power throughout the acceleration range—providing best-in-class fuel economy in cruise mode (2,000 to 4,500 rpm). Programmed Electronic Fuel Injection delivers the precise amount of fuel/air to each engine cylinder, resulting in easy starting, along with instant throttle response and improved fuel efficiency. Superior battery charging is achieved with the Honda exclusive neodymium magnet flywheel. As a point of reference, the BF100 produces 44 total amps and 35 charging amps; measurements are taken at normal operating temperatures. A new, high performance gear case reduces drag, and minimizes hull porpoise and spray to increase acceleration and top speed. In addition, the Honda BF100 engine is NMEA 2000 certified (parameters of this certification are defined and controlled by the U.S.-based National Marine Electronics Association). This accreditation means that the product has been tested to meet specific critical safety criteria and to correctly implement network management and messaging. NMEA developed this open architecture electronic protocol to allow engine data to be interfaced with a variety of name brand marine electronics. In meeting this certification, the BF100 does not require the added expense of proprietary gateway devices. 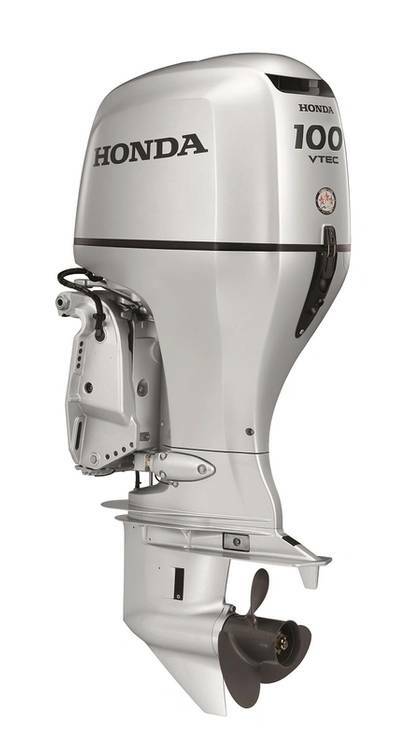 The all-new Honda BF100 outboard engine will be available at Honda Marine dealers nationwide beginning January 4, 2016. All new Honda outboard engines sold for recreational use, including the new BF100, offer a five-year, non-declining limited factory warranty that is the same on the last day as it is on the first.